An MI6 agent goes missing in Jamaica. Secret Agent James Bond is sent to investigate. He soon discovers that the missing agent was on the trail of Dr. No, a mastermind criminal with a secret mining operation on a haunted island. James Bond's mission is to stop this madman before he destroys the entire US space program. 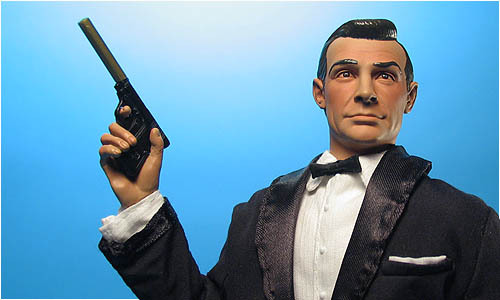 Based on his appearance in the 1962 James Bond film, Dr. No, the Sean Connery as Agent 007-James Bond figure comes dressed in an elegant tuxedo with satin trim. Ready for action with his Walther PPK and Beretta hand-guns. Complete with 1/6 scale liquor bottle, glass and martini shaker. Perfect for his 'Shaken, not stirred' martinis.